Pablo Neruda was the pen name and, later, legal name of the Chilean poet-diplomat and politician Neftali Ricardo Reyes Basoalto. He derived his pen name from the Czech poet Jan Neruda. He won the Nobel Prize for Literature in 1971. Neruda became known as a poet while he was still a teenager. He wrote in a variety of styles, including surrealist poems, historical epics, overtly political manifestos, a prose autobiography, and erotically charged love poems and sonnets. Neruda's father opposed his son's interest in writing and literature, but he received encouragement from others, including the future Nobel Prize winner Gabriela Mistral, who headed the local girls' school. When he adopted the pseudonym Pablo Neruda, he was a published author of poems, prose, and journalism. He is thought to have named himself Neruda after the Czech poet Jan Neruda. The young poet's intention in publishing under a pseudonym was to avoid his father's disapproval of his poems. In 1921, at the age of 16, Pablo Neruda moved to Santiago to study French at the Universidad de Chile, with the intention of becoming a teacher. However, he was soon devoting all his time to writing poems. By the age of 20, Neruda had established an international reputation as a poet, but faced poverty, and had four unsatisfying relationships; These came to inspire many of his conflictive love poems. Neruda's passion for writing love poetry is particularly evident in the early Veinte poemas de amor y una cancion desesperada (1924; Twenty Love Poems and a Song of Despair). In the love poems of this collection, Neruda presents woman and nature as "two aspects of the same reality" and uses nature imagery to describe women. In 1927, out of financial desperation, he took an honorary consulship in Rangoon, the capital of the British Indian colony of Burma, then administered from New Delhi as a province of British India. Later, mired in isolation and loneliness, he worked in Colombo (Ceylon), Batavia (Java), and Singapore. In Java he met and married his first wife, a Dutch bank employee named Maryka Antonieta Hagenaar Vogelzang. 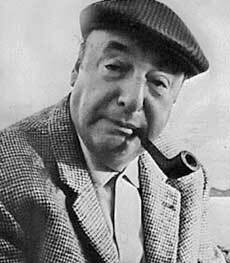 After returning to Chile, Pablo Neruda was given diplomatic posts in Buenos Aires and then Barcelona, Spain. He later succeeded Gabriela Mistral as consul in Madrid, where he became the center of a lively literary circle, befriending such writers as Rafael Alberti, Federico García Lorca, and the Peruvian poet César Vallejo. As Spain became engulfed in civil war, Neruda became intensely politicised for the first time. His experiences of the Spanish Civil War and its aftermath moved him away from privately focused work in the direction of collective obligation. Neruda became an ardent Communist for the rest of his life. He lost his post as consul due to his political militancy. His marriage broke down and the couple divorced in 1936. His ex-wife moved to Monte Carlo and then to the Netherlands with their only child, and he never saw either of them again. After leaving his wife, Neruda lived with Delia del Carril in France. Neruda's next diplomatic post was as Consul General in Mexico City, where he spent the years 1940 to 1943. While he was there, he married del Carril, and learned that his daughter Malva had died, aged eight, in the Nazi-occupied Netherlands. In 1943 he returned to Chile and in 1945, Neruda was elected a Communist Senator for the northern provinces of Antofagasta and Tarapacá in the Atacama Desert. Bolstered by his experiences in the Spanish Civil War, Pablo Neruda, like many left-leaning intellectuals of his generation, came to admire the Soviet Union of Joseph Stalin, partly for the role it played in defeating Nazi Germany and partly because of an idealist interpretation of Marxist doctrine. On Stalin's death that same year, Neruda wrote an ode to him, as he also wrote poems in praise of Fulgencio Batista "Saludo a Batista", ("Salute to Batista") and later to Fidel Castro. Due to his protests against President González Videla's repressive policy against striking miners, he found himself threatened with arrest, and went into hiding. He and his wife were smuggled from house to house hidden by supporters and admirers for the next thirteen months. Neruda's life underground ended in March 1949 when he fled over the Lilpela Pass on the Andes Mountains to Argentina on horseback. From Argenitna he traveld to Europe. Pablo Neruda would dramatically recount his escape from Chile in his Nobel Prize lecture. Once out of Chile, he spent the next three years in exile. He returned to Chile in 1952 after the fall of the González-Videla government. By this time, Neruda enjoyed worldwide fame as a poet, and his books were being translated into virtually all the major languages of the world. He vigorously denounced the U.S. during the Cuban missile crisis and later in the decade he would likewise repeatedly condemn the U.S. for the Vietnam War. In 1970, Neruda was nominated as a candidate for the Chilean presidency, but ended up giving his support to Salvador Allende, who later won the election and was inaugurated in 1970 as the first democratically elected socialist head of state. Shortly thereafter, Allende appointed Neruda the Chilean ambassador to France, lasting from 1970–1972; In Paris his health began to deteriorate. Neruda returned to Chile two and half years later due to his failing health. In 1971, Neruda was awarded the Nobel Prize, a decision that did not come easily because some of the committee members had not forgotten Neruda's past praise of Stalinist dictatorship. Neruda died of heart failure 1973. The funeral took place amidst a massive police presence, and mourners took advantage of the occasion to protest against the new regime, established just a couple of weeks before. Neruda's house was broken into and his papers and books taken or destroyed.